These sweet and highly nutritious nuts are a great source of plant derived fats, protein, and essential minerals and vitamins. 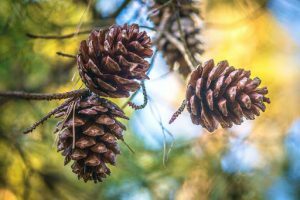 They come from the seeds of the female cones, often seen in large, green bushy pine trees. The most common species are the Pinyon pines which grow in south-western United States. They’re easy to harvest and are crunchy with a buttery texture. 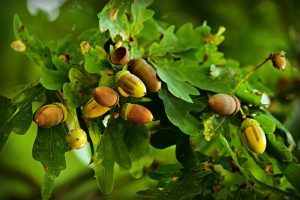 These nuts from the humble acorn tree have been used as a as a staple food source by our ancestors in the northern hemisphere for thousands of years. Full of energy-giving carbs, some protein and fat, 1 ounce of nut meat contains just over 100 calories. The bitter, acidic taste can be removed by breaking them into chunks, then soaking in warm (not boiling) water. from the Great Lakes region, Minnesota, Michigan and Idaho, to the states of Florida and Texas, and on the Atlantic and Gulf coasts. An ounce of raw rice contains 100 calories, is high protein and dietary fiber and also low fat. 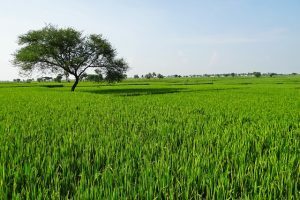 You can easily harvest a substantial amount of these aquatic plants, by paddling to a rice bed, and tapping the ripened heads to release the rice grains. 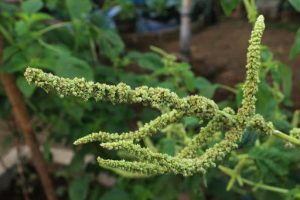 Wild Amaranth seeds have been eaten for thousands of years. It was in fact, one of the main foods of the ancient Aztec civilization. 100 grams of cooked amaranth provides 103 calories, consisting of 4 grams protein, 19 grams carbohydrates and just 2 grams fat, along with numerous minerals. 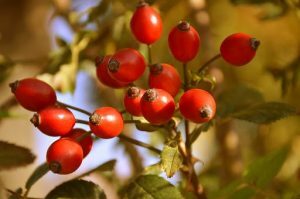 The rose hip (also known as the rose hep), are the red and orange colored fruit of the wild rose plant. They ripen in late summer and autumn. They can be eaten raw (avoid the hairs) or cooked (e.g. jam, marmalade, syrup, beverages, bread). 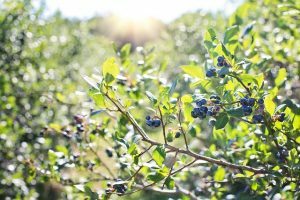 Commonly found growing wild in North America, blueberry shrubs have white or pinkish colored bell-shaped flowers, which after pollination in summer, develop into dark blue and purple fruit. 100 grams of these sweet berries supplies 57 calories; that includes 14 grams of carbohydrates and also vitamin’s C, K, manganese and fiber. 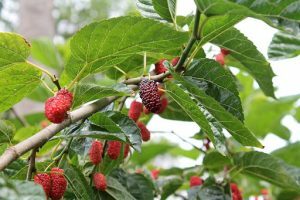 The Mulberry tree is native to eastern states of the US, and can grow up to 15 metres in height. It bears berries about 2 cm in length, which are in fact multiple fruit. They start off as white or green in color and then mature into a dark purple fruit. A 100 grams serving can supply you with 43 calories, and one-third of your daily vitamin C requirements. Take care when handling the under-ripe fruit and the green leaves or stems,as they often contain a toxic white sap. The wild strawberry (also called the common strawberry) occurs naturally in North America. Although they only contain 45 calories per cup, this is more than your daily Vitamin C requirements. Wild strawberries, are sweet, flavorful and have tan seeds on their surface. The perfect survival plant, Dandelion grows in many areas of the world. While many homeowners consider the plant to be a weed, the Dandelion is a great source of nutrients. This natural wonder is loaded with Vitamin A, C, and K. Also, this plant provides a good source of calcium, potassium, and magnesium. The parts of the Dandelion plant which are edible, includes: the leaves which can be cooked like greens, flowers, and the root which makes a wonderful substitution for coffee making it a great all-round survival food. 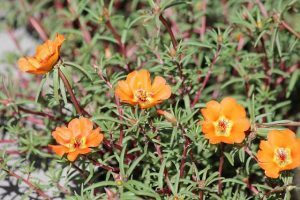 Purslane is a small plant with smooth, red colored leaves. It’s yellow flowers may appear in any month of the year. These form into tiny pods of seeds. The leaves can be eaten raw as a vegetable salad. Alternatively, the distinctly sour, salty taste of raw leaves can be removed by boiling. The stems and flower buds are also edible. 100 grams supplies 20 calories as well as much needed vitamins (A, C, E and B) and minerals (iron, magnesium and calcium). The humble clover leaf is actually edible. They are found all over the globe, especially in wide, open grassy areas. They can be spotted by their distinctive trefoil leaflets. You can eat clovers raw. Though boiling gives a better taste. 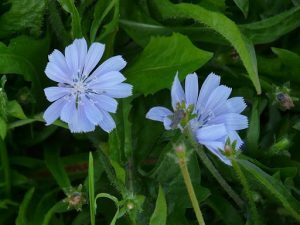 Chicory grows in North America, Europe and Australia. This bushy plant has small light purple flowers. The whole plant can be eaten. Young leaves can be pluck off the bush, and eaten raw or boiled (to remove the bitter taste). The flowers make for a tasty snack by popping them in your mouth. The roots acquire a better taste after they are boiled. Chickweed can be found in temperate regions of North America. Often found in meadows, waste places and open areas. 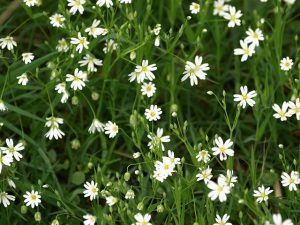 The plant has large leaves, and it blossoms small white flowers, from May to July. The leaves (which have lost of vitamins and minerals) can be eaten either raw or boiled. Although native to Europe, Sheep sorrel also occurs in North America. 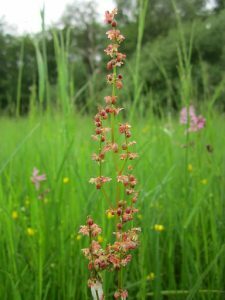 Commonly found amongst other ‘weeds’ in open grasslands and woods. They can be identified by the red-colored stems and green arrow-shaped leaves, at around 0.5 meters in height. The raw leaves have a lemon-type taste, but shouldn’t be eaten in large amounts as they contain mildly toxic oxalates. 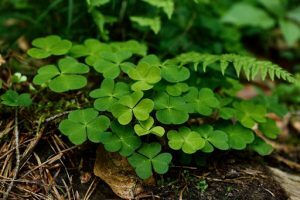 You’ll find wood sorrel growing all over the world, it’s particularly widespread in South America. 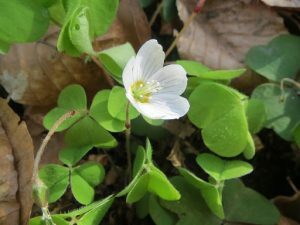 Wood sorrel has been used as a food source for thousands of years. Native Americans used it as a mouth sore remedy and as a thirst-quencher by chewing on it. The leaves are rich in vitamin C. The roots can be boiled, and their taste is similar to a potato. 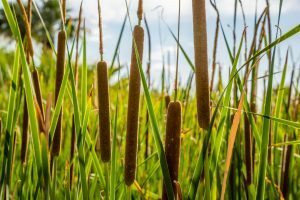 These water-loving plants grow near the shores of lakes and wetland areas. They can be easily identified by their distinctive cigar-shaped spikes, poking up from the water. Native Americans used them as a staple in their diet. You can eat most of the plant. Their fibrous roots are not only a fantastic source of carbs and protein but nutritious. Dig up the rootstock, wash the mud off and either boil or roast it over a campfire. Cut off the bottom part of the stem (colored white); this can be eaten raw or boiled. The leaves can be boiled too. Even the corn dog-looking spike can eaten – it actually tastes like corn! How can you avoid coming into contact with a poisonous plant? It’s all about knowing what to look for and what to do in case of contact, absorption or ingestion poisoning. If you do come in contact with the plant, isolate the infected area. Clean the area with rubbing alcohol or better yet, a specialized poison-plant skin wash. You can also use degreasing soaps or detergents to clean it off. After cleaning, apply wet compresses, calamine lotion, or hydrocortisone cream to the skin to reduce itching and blistering. You can also use body power to soothe the rash. Banana peels also contain antifungal, antibacterial properties that can be used for rash relief. If you don’t have calamine lotion or other creams, a banana placed on the affected area can provide some relief. Potato and oatmeal have anti-inflammatory properties that treat many conditions, including sunburn. They can also be used to treat a poisonous skin reaction if made into a paste. Vodka can substitute for rubbing alcohol in a pinch and will sterilize a rash. Coffee contains an acid that acts as an anti-inflammatory and will soothe irritation. 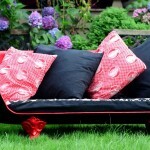 Mix cold black coffee with a few tablespoons of baking soda to make a paste and spread over the infected area. Ingestion poisoning can be serious or even fatal. Signs and symptoms of ingestion poisoning include nausea, vomiting, diarrhea, abdominal cramping, depressed heartbeat and respiration, headaches, hallucinations, dry mouth, unconsciousness, coma and death. Try to remove as much of the plant from the person’s mouth as possible – have them spit it out if they are conscious. 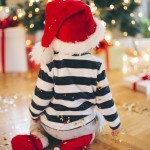 Induce vomiting by tickling the back of their throat or give them warm salt water – or try to dilute by drinking lots of water. Watch animals and eat what they eat. This is not always true as sometimes animals can eat plants that humans cannot. Boil the plant and any toxins will be removed. Boiling does not remove all toxins – more on that with the universal edibility test. Red plants are always poisonous. Not all red plants are poisonous, but many are like holly and mistletoe. 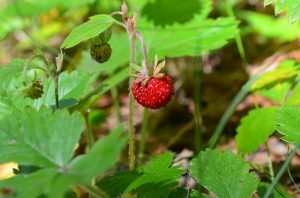 Learning to complete the Universal Edibility Test should be a priority before you set out on any camping trip or even a hike in the mountains. Separate the leaves, any flowers and the stem of the plant your testing. 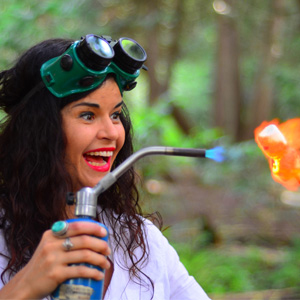 Test for a reaction by placing a portion of the plant against your lips. Wait 15 minutes to see if you have a reaction. If there is no stinging or burning, you can continue. Place the portion you are testing on your tongue, but do not chew or swallow. Wait 15 minutes to see if you react. If you do not, you can test another portion of the plant the same way. Continue until all the sections of the plant have been tested. Take one portion of the plant that passed the tests above and prepare it as you would if you were eating an edible wild plant – this is where the cooking portion of the test comes in. Place a small amount of this in your mouth and chew. Do not swallow at this time and wait 3 minutes. If there is no reaction you can move on to the next portion of the test. Swallow the portion of the plant you have chewed and wait 8 hours. During that time frame, if you experience any reaction, induce vomiting to remove the toxins from your system. If there is no reaction, continue the test. Prepare a quarter of a cup of the plant portion you prepared and eat. Wait another 8 hours. Again, if you react, induce vomiting. If there is no reaction, that portion of the plant is safe to eat and has passed the universal edibility test. Please note: If you have a reaction during any part of the test it means the plant portion has failed the universal edibility test and is not safe. White, umbrella-shaped cluster of flowers: If you see a bundle of white flowers that make an umbrella shape, do not eat them! This could be one of two plants: a water hemlock that grows near water and can be six or eight inches tall, or the poison hemlock that grows away from water and can be very tall. Both plants are highly toxic. In the winter, these plants can be mistaken for other plants and have tubers growing at the end of their stalk that look and smell like a carrot or parsnip. All parts of the hemlock are toxic. Waxy leaves: Another characteristic of a poisonous plant is having waxy leaves, like a holly leaf. Thorns or hairs: You should check the leaves and stems or stalks of a plant for thorns or fine hairs. Stay away from these plants, too. White, milky sap: Pop off a leaf and break it open, then squeeze it between your fingers to see the sap’s color. 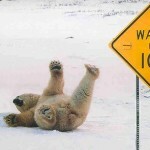 If it is white and milky stay away – although sometimes even clear sap can be poisonous. This would be the time for you to use the universal edibility test! Avoid all mushrooms: Mushroom identification is difficult and not precise and if you eat the wrong one it could cause immediate death – worse-case scenario. “Best case” would be gastrointestinal distress – it would be best to avoid all together. *Dan Patrick loves being active outdoors. He’s been involved in the world of survival and prepping from an early age. Even at five years old, he looked forward to hiking trips on wilderness trails with his father. Dan now takes a keen interest in sharing his survival skills knowledge by helping others. You can read more at https://survivaldan.com.